When all is going well it tends to be easy to trust and hope in God - after all, all is going well. But, when times are difficult and things are not working out the way we hoped, we may find it more difficult to trust and hope in God. Our grandchildren are watching. If our faith is only strong when things are going well, they are not likely to embrace it. They will have difficult times in their lives. They need to see our faith is real in the times when all is going well and even more so when things are not working out. 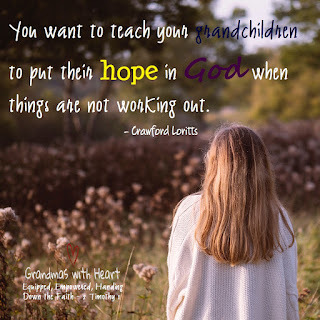 Model what it looks like to trust and hope in God at all times; our grandchildren are watching!